Landscapes from the Himalayan Kingdom of Bhutan, the country where Gross National Happiness is more important than GDP. 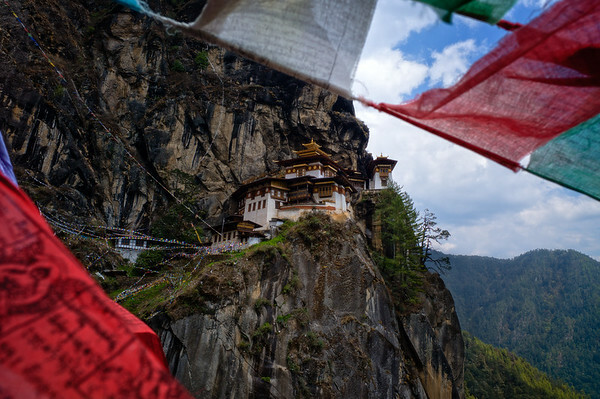 These landscapes come from throughout Bhutan, which reaches from the peaks of the Himalaya Mountains down to the tropical lowlands near the border with India. Mt. Jomolhari rises 2,700 meters (8,900 feet) above the plains of Bhutan's Thimphu district, and is one of Bhutan's highest peaks. An early morning rise, after a long previous day hiking to Tiger's Nest, we began the drive to Chele Pass. At 3,780 meters (12,402 feet), the Pass can provide incredible vistas of the Paro Valley, Haa Valley, and the Himalya, depending on the weather. Both times I've been there the weather has been good until shortly after sunrise, when the clouds have come in. 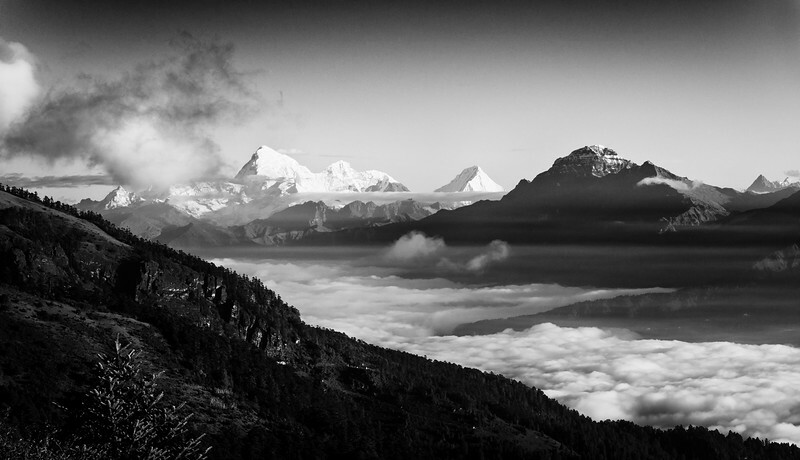 In this first visit, I was able to see Mr. Jomolhari, rising above the blanket of clouds covering the valley below. But, shortly after this image was captured, the clouds rose to my level and the view was completely gone. It was well worth the early rise, the long drive, and the freezing temperatures to hike from the Pass to this vantage point. An experience I will remember and cherish for years to come. 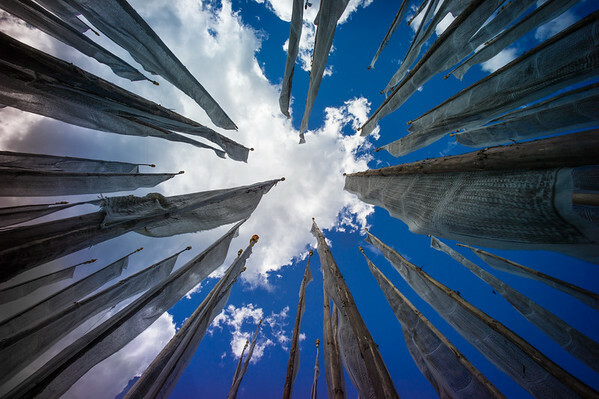 Throughout Bhutan, one will see clusters of these vertical, white prayer flags. 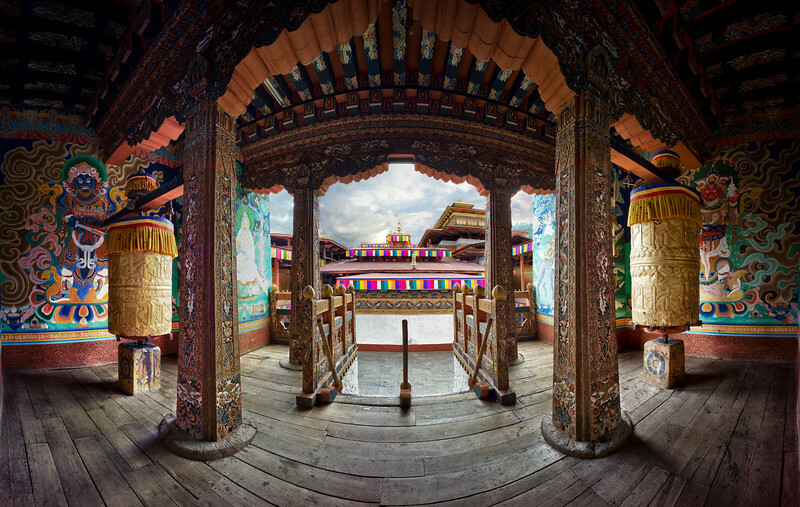 Made from freshly cut pine trunks, the flags have Buddhist scriptures written throughout. These types of prayer flags are erected when someone passes away. If the family can afford it, 108 of the flags will be raised in a cluster on a hillside. Because they are placed so close to each other, I envisioned this type of shot and then spent the next two weeks looking for the right grouping to craft this image. I wanted to use a very wide angle lens to accentuate the height of the flags and capture as many of them as possible. Placing the camera on the ground, triggering the self-timer, and running away to get out of the frame, it took several experiments to get this image framed and exposed correctly. I can almost imagine the family erecting these flags knowing their deceased relative will always have a view of the great Bhutan sky and landscape. Located on one of the several mountain passes we transversed in Bhutan, I climbed from the parking area up a hillside covered in thousands of prayer flags. Some were old, tattered, faded and weather beaten; others were brand new, having been raised just a days before our arrival. 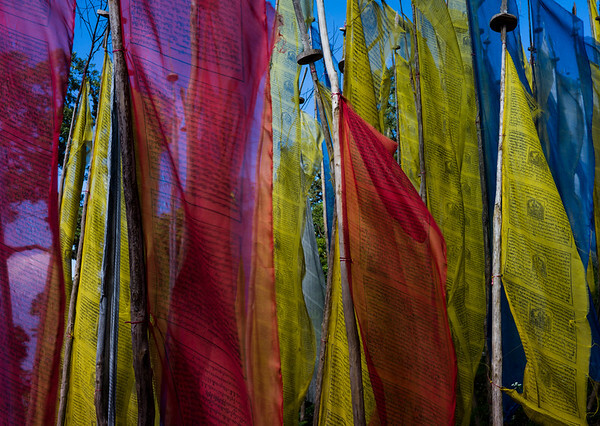 Covered with Buddhist scripture, these flags stand for as long as they survive in the Himalayan wind and weather, only to be replaced after they have disintegrated based on the timeline of nature. While the hillside of prayer flags was a great sight, I tried to focus on a smaller scene here, foregoing the vastness for the details; focusing on the vibrant colors in front of the deep blue sky. It was cold. It was windy. And, it was stunningly beautiful. All this applies to Chele Pass, which I visited for the second time in the early morning hours during my most recent trip to Bhutan. I focused on the grand vistas viewable from the high altitude of Chele Pass as the sun rose above the mountains and bathed the clouds blanketing the Paro Valley in sunlight. 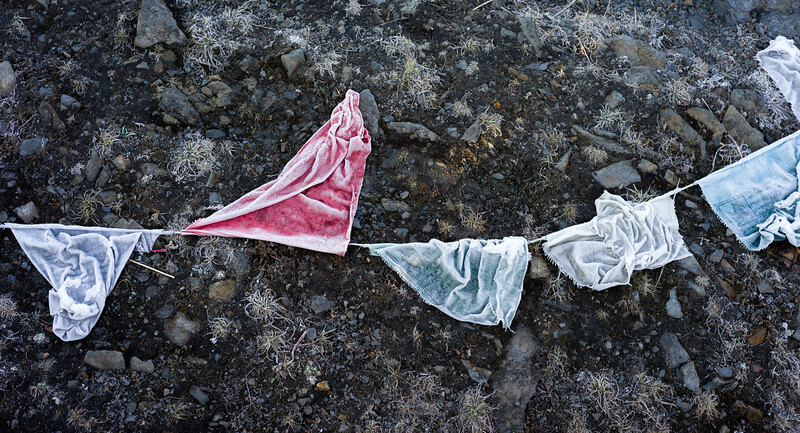 Then, after the sun had risen higher in the sky, I turned to the smaller details of the Pass, including these prayer flags I had seen earlier on my hike up the mountain. I stood near the flags, ever respectful of the Buddhist prohibition of stepping over fallen prayer flags, and captured these flags before they thawed in the growing sunlight. The ground was frozen solid, and so were the flags, encrusting the folds, scripture, and colors in a thin layer of frost. The scene was not meant to last long, as the first sun ray hitting the frozen ground is visible to the right of the red flag. One of the most spectacular structures I've seen anywhere. Period. Part of the allure of this monastery, beyond the fact that it is literally constructed on the side of a mountain, is the adventure of getting there. After arriving in Bhutan the day before, we began a climb of about 3,000 feet (900 meters) up from the Paro Valley. The views of Tiger's Nest improve as you ascend over the mountain trail, until you reach an area at the half way point where you are level with the monastery; where this image was taken from. Colorful prayer flags span the chasm, encountered during the last hour of the hike up, and continue up the mountain face near the monastery, and help put the size of it into perspective. Since this was my second visit to Bhutan and Tiger’s Nest, I tried to capture the monastery from a few different vantage points. I remember thinking this specific view would work because I could frame the monastery between two rows of prayer flags, but still show the height of the cliff and get the sky in the background. 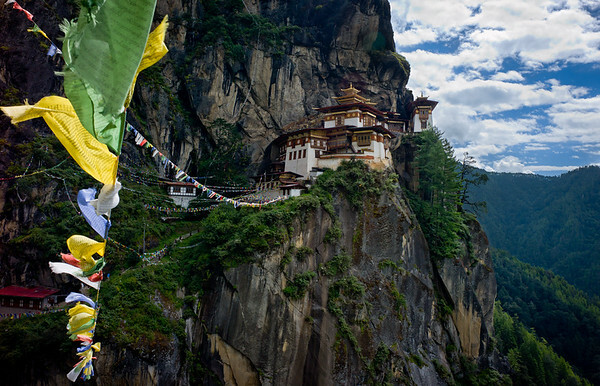 Officially called the Taktsang Palphug Monestary, the complex was first built in 1692, though it was most recently rebuilt after a 1998 fire. Mt. Jomolhari rises 2,700 meters (8,900 feet) above the plains of Bhutan's Thimphu district, and is one of Bhutan's highest peaks. An early morning rise, after a long previous day hiking to Tiger's Nest, we began the drive to Chele Pass. At 3,780 meters (12,402 feet), the Pass can provide incredible vistas of the Paro Valley, Haa Valley, and the Himalya, depending on the weather. Both times I've been there the weather has been good until shortly after sunrise, when the clouds have come in. In this first visit, I was able to see Mr. Jomolhari, rising above the blanket of clouds covering the valley below. But, shortly after this image was captured, the clouds rose to my level and the view was completely gone. It was well worth the early rise, the long drive, and the freezing temperatures to hike from the Pass to this vantage point. An experience I will remember and cherish for years to come.